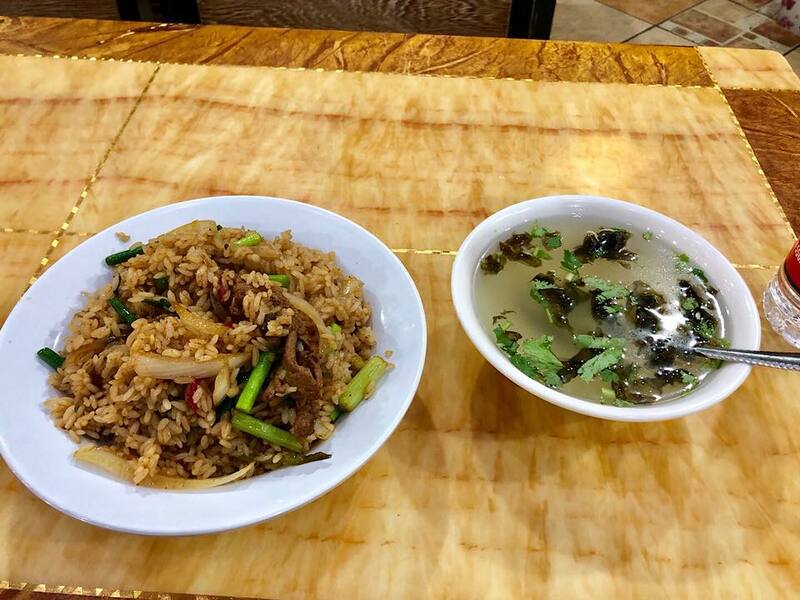 After my day sightseeing, I was back in Zhangye and looking for food. It was fascinating to me that I didn’t see any international tourists whatsoever when I wandered the streets. In a couple posts online people had written that they didnt see a single other white person there the whole time. It felt so cool to me that I was this far off the beaten track that I was the only foreigner in town. Just as I was thinking that, I noticed some foreigners sitting at a table. Dammit. Well, I am *almost* the only foreigner in town. Again, I went back to the same little area that had hundreds or restaurants and stalls, and again I wandered around awkwardly not being sure what to get. I decided to get some fried rice for a change after living off of dumplings, noodles, and stir-fry for days. I went into a place that had several photos of fried rice on the wall. All the photos were a bit blurry and it was impossible to tell exactly what was going to be in the rice. I randomly point to one. As usual, even with just pointing to a photo, there is confusion and she rattles off a bunch of questions to me, none of which I understand. She gives up trying to explain/ask and just motions me to sit down. After some time, a server brings me this bowl of broth with a few herbs floating around in it. Umm.. Huh? This is clearly not what I ordered. I mean, the photo wasn’t super clear, but it was definitely rice. Did I somehow miss something important when the woman was asking me all those questions? I sit there for a while wondering how to confront them and explain that this was not what was in the photo. To make things worse, I taste the broth and it is completely bland. This is not what I want. I sit for a while, trying to muster courage for the confrontation and start googling translations. Finally, just as I was about to get up and walk across the room, the server comes back and gives me my fried rice. Ohhhh. I guess the broth thingy was just a bonus that they give you before your meal. Lol… So glad I hadn’t gotten up yet and shamed myself by complaining! In the end, the fried rice was great. Oh, one other thing I’ve wanted to mention. 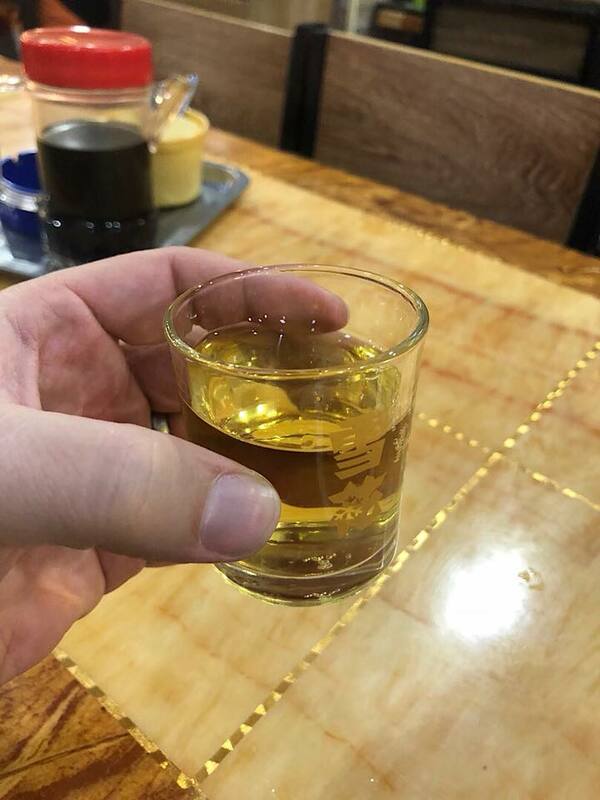 For some reason, the people here drink beer out of the tiniest tiny cups. They are maybe 2 or 3 shots worth of beer. No idea why the cups are so little! On top of that, all the beers that you get are large beers like a 22oz, so the tiny cups seem even more ridiculous given the size of your beer.